In September, the Kiwanis Club of Healdsburg hosted their first annual Kiwanis Safety Fair in collaboration with AT&T and PG&E. 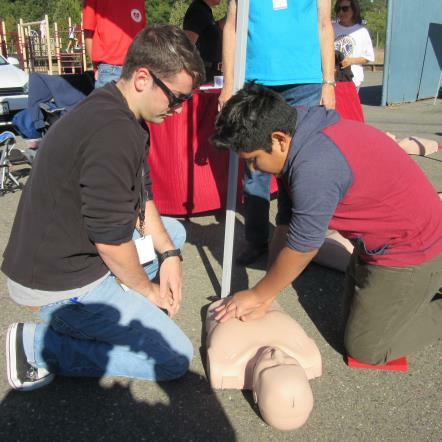 With the help of a Pediatric Trauma Prevention Grant from the Kiwanis Cal-Nev-Ha Foundation, and assistance from 18 community organizations like the Healdsburg Fire Department and the Red Cross, more than 320 attendees were provided comprehensive education and training on safety. Looking for a way to promote safety within their community, especially within their Hispanic community, the Healdsburg club and their partners educated guests on proper child safety seat installation, hands-only CPR, and proper bike and helmet usage. Additionally, the club provided 94 children with new helmets, inspected and repaired 18 bicycles, donated 4 child safety seats (donated by the California Highway Patrol), provided 30 guests with fire extinguisher training, and served 300 meals. Club member Sue Sheehy served as an ambassador at the event, greeting guests as they arrived and explaining the activities. According to Sheehy, “One Hispanic mother saw our flyer at the library . . . She decided to bring them right then and she was so surprised and grateful for everything. At the end she came up and gave me a big hug and asked about Key Club and how kids could get involved in that.” Looks like we may have future Key Clubbers as a result of this event! The outstanding turnout of this event proved a need for safety education within the community, and the Healdsburg club is encouraged to repeat this project in the future for more families.